The sister of the Majestic apartment building several blocks to the north on Central Park West, the Century is one of the masterpieces of developer Irwin S. Chanin, who also built the great 56-story Chanin Building on East 42nd Street and many famous theaters around Times Square such as the Roxy, the Biltmore and the Majestic. Like the Majestic, it was designed by Chanin's in-house architecture department headed by Jacques Delamarre and assisted by sculptor/designer René Chambellan in a modified Art Deco style. While the twin-towered massing is similar to that of the Majestic, it differs in its vertical emphasis of six sets of bay windows and, most importantly, in its circular geometric elements on the west side of the tops of the towers. At the turn of the 20th Century, the area had many automobile showrooms and in 1908 the blockfront site was acquired by a civic repertory company that erected a theater designed by Carrère & Hastings that opened the next year. For a while, the elegant building, known as the Century Theater, served as an opera house, but was acquired in 1920 by the Shubert theater organization. In his fine book, "Upper West Side Story, A History And Guide," (Abbeville Press, 1989), Peter Salwen noted that the Century Theater played host to performances by the Metropolitan Opera, Konstantin Stanislavsky and the Moscow Art Theater, Isadora Duncan, Eleanor Duse, Sergei Diaghilev and his Ballets Russes, and Max Reinhardt and that its basement for a while had a nightclub hosted by Texas Guinan and that its roof garden also became a nightclub, the Coconut Grove, designed by Joseph Urban. Chanin, who had retained an interest in several Times Square theaters, exchanged them with the Shuberts for the site and in August, 1929, announced plans for a 65-story tower that was to have been known as the Palais de France with three floors of retail space and 27 floors of hotel use and 30 floors of offices for the French consulate and tourist offices and French companies. In his excellent book, "Luxury Apartment Buildings of Manhattan: An Illustrated Survey," Dover Publications, 1992, Andrew Alpern observed the building's variation on Art Deco style "were more than an arbitrary decoration; they helped cushion the shock of the Great Depression." "The original drawings called for 416 apartments of 52 distinct varieties, ranging form a single room with a small serving pantry to an 11-room duplex maisonette with a private entrance from the street," Alpern noted, adding that some of the one-bedroom units were duplexes. The building has a U-shaped lobby around a landscaped rear court and the lobby has entrances on Central Park West and the sidestreets. An attempt to convert the rental building to a cooperative failed in 1983, but it was finally converted to a condominium in 1987. It is one of the few buildings on Central Park West with street-level retail space. As John Tauranac notes in his brilliant book, "Essential New York, A Guide to the History and Architecture of Manhattan's Important Buildings, Parks and Bridges," Holt Rinehart Winston, 1979, the Century and the Majestic "are cool, cut down to their essentials, with bold massing and clear statements of strength." The Century opened in 1932, two years after the Majestic, and it was the last of the four great twin-towered apartments to be erected on Central Park West. Over the years, its residents have included agent William Morris, Lee Shubert, the theater magnate, writer Marc Connelly, and entertainers Ethel Merman, Robert Goulet, Ray Bolger, Fay Wray and Nanette Fabray. "In the Majestic and the Century apartment houses of 1930 and 1931, respectively, Irwin Chanin, working with Jacques Delamarre, as well as with the firm of Sloan & Robertson, combined the compositional solidity of the columnar skyscraper, the aerodynamic asymmetries of the International Style, and the decorative futurism of French Modern Classicism to create what are among the most original exemplars of the spirit of modernity that swept American architecture in the late 1920s. The Majestic replaced Alfred Zucker's Hotel Majestic at the southwest corner of Central Park West and Seventy-Second Street. 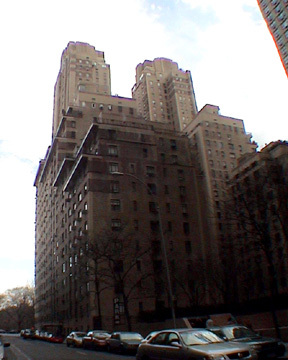 Chanin had originally intended to replace the hotel with a larger, more modern version but soon abandoned those plans in favor of a luxury apartment house, which he drastically modified during construction, cutting up his ten-room-per-floor tower apartments into two units of four- and six-rooms each in order to increase their marketability during the Depression. The flattened pilasters of the design rose up through the base as lines of structural force interlaced by the stacked apartment floors, the horizontality of which was emphasized by continuous bands of glass stretching across the corners (and enclosing narrow solariums within). On the setbacks, long terraces further emphasized the horizontality and heightened the sense of the towers as the natural last stage in the evolution of the base. The Century replaced Carrère & Hastings Century Theater on Central Park West between Sixty-second and Sixty-third streets. Chanin's original plans for the Century site called for an apartment complex that would include a permanent display center featuring the governmental, commercial, and cultural life of France. The exterior of the upper floors was to be entirely of metal and glass. But the mounting effects of the Depression turned Chanin in a more conventional direction. At the Century the sweeping curves of the back of the towers evoked turbines. The treatment of the towers pushed the overall composition toward the dynamic Modernism exemplified by the work of German architect Erich Mendelsohn whose abstracted images of machines constituted the most popular manifestation of the Modernist impulse at the time. While the complexity of placing towers on bases might have tended to restrict the inventivenes of the architects in arranging apartments, the opposite seems to have been the case. The Century had fifty-two types of apartments ranging from one-room flats to eleven-room suites, with many one-bedroom duplexes, an unusually homelike arrangement for a small unit. Lewis Mumford was not particularly impressed with the designs for either of the buildings: 'The new exercises in period modernism along Central Park West cause one's eye to linger with extra pleasure on the Dakota Apartments...will our half-baked 'modern' apartment houses that are now springing up along the Park look half as real and convincing fifty years from now? I will answer the question. Absolutely not! The 'modernism' of these buildings is merely a thin veneer; banked corner windows that light long, narrow rooms; occasional terraces fitfully disposed albout the upper parts of the structure's massive brick enclosures of water tanks. Even the relatively plain facades do not authenticate these structures...But these apartments are far from being solid and useful examples of modern architecture, and they do not give a hint of what a good architect could do were he able to work on land of reasonable price and on plots large enough to permit effective planning. In all essentials the Dakota is as close to organic architecture as its most up-to-date neighbor, that is, they are both about fitty years away from the real thing. In 1932 Mumford made the point that while the new apartment houses of Chanin and Delamarre and others had about them the hint of an authentic modern architecture, their only genuine contribution was 'the increasing breadth of the windows. The fear of sunlight and air, which we quaintly think confined to the French is beginning to disappear among the well-to-do, who have so often been content with dark, back-to-back houses and apartments which differed only in price, space and internal cleanliness from our worst slums.'" Mumford's judgment is too harsh. The Chanin skyscrapers have an élan that is terrific and very energetic. While they pale beside an Art Deco masterpiece such as the Chrysler Building, their dynamic is exciting even if their make-up is less than super luxurious. The building has a U-shaped lobby around a landscaped rear court and the lobby has entrances on Central Park West and the sidestreets. An attempt to convert the rental building to a cooperative failed in 1983, but it was finally converted to a condominium in 1987. The business committee of Community Board 7 voted last June 9, 2010 7 to 2 to recommend approval by the full board of a proposal by Greg Hunt to open a wine bar on the northwest corner at 62nd Street in the ground-floor retail space of the Century at 25 Central Park West. "More than 100 people packed" the committee's small meeting room and about 18 people spoke in favor of the proposal and 35 in opposition, according to an June 9, 2010 article by Avi at westsideindependent.com. The vote in favor of the proposal was a big surprise to people in the room, many of whom lived in 25 CPW and its neighbor to the South, 15 Central Park West. One opponent of the plan is Roberta Brandes Gratz, a resident of 25 Central Park West who is a member of the city's Landmarks Preservation Commission. Mr. Hunt agreed to make changes to appease some of his critics," according to the article, "in particular saying he would close the bar," shown in the rendering at the right, "down at 2 A.M. on Wednesday through Saturday and 1 A.M. Sunday through Tuesday. Community Board 7’s business committee also asked him to shoo away patrons once they left the bar, so they won’t hang around carousing and smoking. Those stipulations and a few others were enough to win the vote." The proposed cafe and wine bar would be designed in Art Deco-style and would accommodate up to 74 people including staff. Its design by Glen Cobin would "include wood paneling, sophisticated Art Deco lighting, and portraits of some of the famous former residents of the Century." The cafe's website proclaims "we’re targeting clients who are old enough to know who Ray Bolger, Ethel Merman and Fay Wray are!" Breakfast, lunch and dinner will be served on weekends, and lunch and dinner will be served during the week and the cafe will offer take-out service exclusively for the residents of the Century.